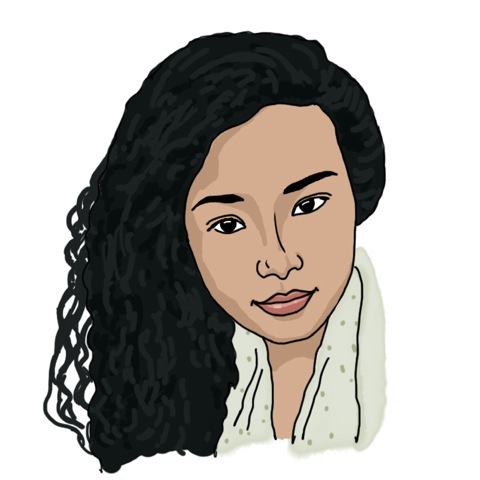 If some of you have been reading the blogs for a while, then you may know about the Muti Water Project, an initiative I had been busy working on since my sophomore year. I worked to design and build a longer lasting water source for a town, Muti, in my father’s home province, Kafa, where he went to middle school and where some of my relatives still live today. I’ve written two blogs about it already, “A Story About Muti” and “Why is There No Water”. This was a long, arduous process, seriously affected by not only logistics, weather, and funding, but also politics. Several months of delays occurred due to the state of emergency announcement in Ethiopia in 2016. (You can get the full story in those two blog posts + this podcast). 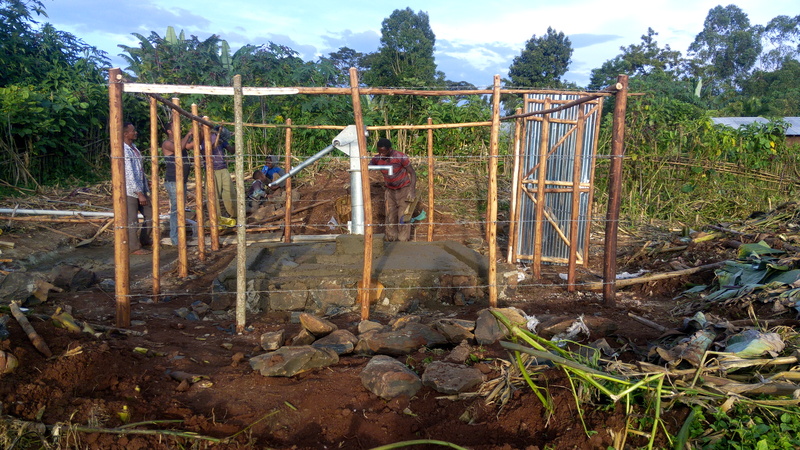 But finally, against many odds, the well is actually finished!!!! It was actually finished some months ago (last semester, November 2017) but today I woke up and realized that I’d left everyone hanging, without actually announcing this positive development (such MIT lol). In “Why is There No Water”, I’d highlighted some key qualitative issues I’d discovered from interviewing Muti residents. Children (as young as 5) are the ones who typically fetch water from rivers and streams. They can have lifetime health problems afterward a from carrying the heavy containers back and forth. People regularly die digging shared, shallow water wells either from collapses or lack of oxygen. Children, followed by women, are the household members most frequently tasked with obtaining water. This will probably still be true, and in some ways is actually intended with the development of this well (we placed the water source next to the primary school, so the youngest children attending school are closest to the clean water). But in addressing other issues, we hope access to water will be safer for these children. This is a problem with the construction of the well. Since this well was much larger in diameter than the shared, shallow wells people just make in their backyards with a shovel, the risk of asphyxiation from the digging process was lower. Additionally, the well was constructed in coalition with trained professionals (whereas wells people construct in their backyard are typically untrained local men, simply digging). This well was also lined with concrete during the construction process. The AfriDev pump is, on the one hand, simply necessary for this well, as it is much deeper than shallow backyard wells. But as a side effect, it is also much safer than an open cavity, which is how children can fall or be pulled into shallow wells by the weight of the water vessel (think rope-and-bucket that you pull to retrieve water). The depth of this well is also what makes the water clean, and prevents typhus/typhoid bacteria from inhabiting the water. This point is particularly counterintuitive for most Americans–how can digging into the ground, the dirt and soil, of all places, be clean? In fact, most of the things that make dirt dirty (bacteria, bugs, decaying debris) are in a thin, shallow layer close to the surface of the soil. This is very simple and obvious when you think about it–most living things (Typhoid bacteria included) need oxygen, and you can’t find much oxygen as you progress lower and lower into the ground. As an example, in natural disaster scenarios, temporary graves as shallow as just one meter below the surface are constructed to bury bodies while preventing decomposition, so they can later be withdrawn and identified (even “six feet under” would be overkill). This is why I chose this hand-dug well concept (over 15 meters, but under 30) for the Muti region. I knew it was simple enough that there were people (contractors and workers) who were familiar with how to construct this system with the parameters we specified, and in this particularly lush, rainy region, we didn’t need to go very deep. We simply needed to get away from the “dirty” dirt to the “clean” dirt–sediment found in water at this depth is more or less larger chunks of whatever’s already in your fancy mineral water: possibly calcium and magnesium deposits, or other inorganic precipitates. No living, typhus-causing things! In many ways, this is the beginning rather than the end. The real goal of this project was to try and see how long the water source would last–if we can beat 3-4 years without the well truly failing (a broken pump, as I mentioned, can easily be replaced) then I will consider the project a success, as the main issue we were trying to solve involved clean water sources frequently failing, going “dry” in as little as 3 months. That success would motivate further hand-dug well projects in the region, where right now spring protections are the default constructed water source. And the proliferation of hand-dug wells would hopefully continue to solve all the above problems–right now with this well, these water problems are solved mainly for those living nearest to the well, and the children at the school. 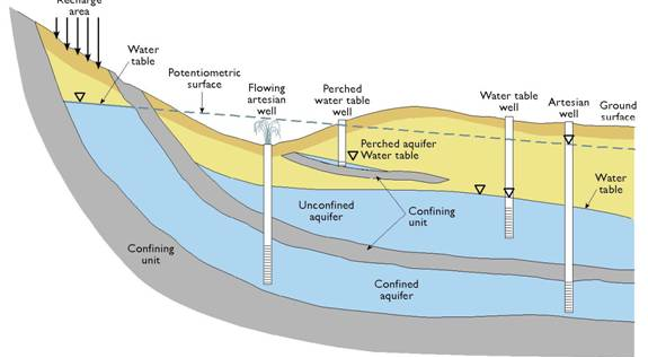 The reasons why water sources can go “dry” are a whole other hydrology lesson, but the core of the issue is that, the water “table” (you can think of it as a line of water under the soil) is not perfectly flat or uniform. Sometimes, you may think you’ve hit the water table, but really, you’ve just hit a little pocket, which can actually become “dry”. In other situations, if your water sources conflict, you can end up “lowering” the water table in that area with frequent use. Sometimes, you can inadvertently turn one of your sources into a drain for another source, causing the first source you built to fail. Of course, there’s still not a great way to “x-ray the ground” which is a silly question I asked in a conversation with the incredible Professor Strzepek of the TATA Center. Professor Strzepek agreed to assist with this project (he provided the above graphic and taught me everything I know about water). Though it was cool to learn about this, I was a little dismayed: I did not have access to sophisticated surveying equipment, and there’s very little water data available about this region. I tried still, though, to make sure we made a good decision about the well location in a pretty hack-y way: with Google Maps. Google maps has some pretty neat features I learned about entirely while trying stuff for this project. For one, it allows you to view the elevation in these cool altitude plots collected from Google satellite data, where those curves in the photo represent a line of the same elevation (for those of you who’ve taken physics, it’s sort of like voltage potential rings). The map is also shaded for an intuitive visual effect. All the other wells are flagged, and the location next to the primary school is the star. Using this feature, I could at least feel mostly confident that the well was far enough from the other springs (and, importantly, not on a hill) so that any interference with the water table wouldn’t affect the life span of the well. Of course, if future sources are built in the next few years, this would need to be revisited. I also gained some intuition as to why the other spring protections failed. Spring protections have to be constructed where there is already surface water, which severely limits your options in location as you have to find a spring, creek, or river to work with. 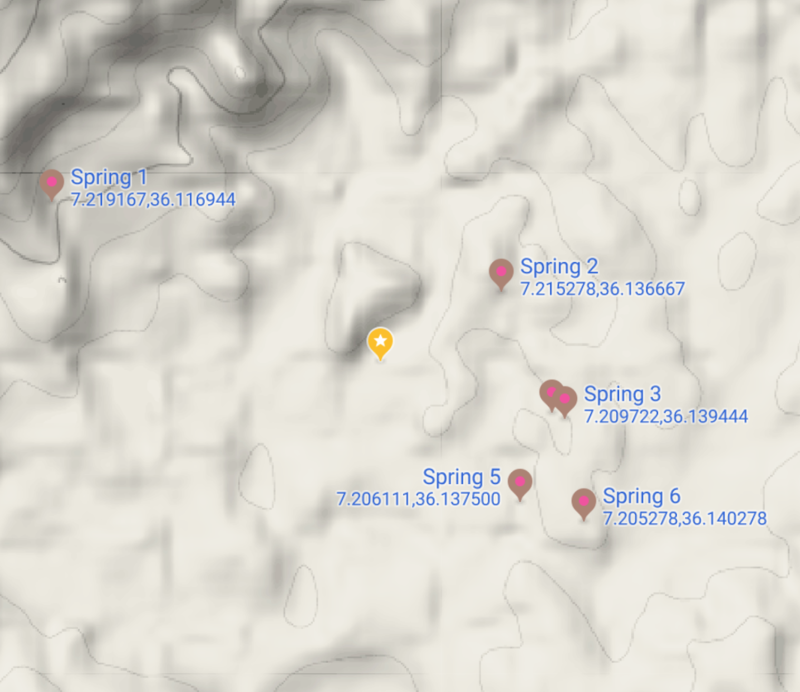 As you can see from the terrain diagram, many of the springs are at points of locally high elevation–they’re on hillsides. They’re also close together–springs 3 and 4 in particular failed particularly fast, with spring 3 failing in only 3 months after it was constructed. You can see a little bit more clearly which water sources are likely to be inadvertent drains for other sources. Performing this project helped me understand water a lot better, but also opened my eyes to the problems engineering alone will never be able to solve. The village, Muti, has a local government and collects tax–the things governments do, in exchange for creating infrastructure. Clearly, in Muti and other rural areas, there is a disconnect between the resource collection and the infrastructure distribution. This can be for a variety of reasons–farmers don’t have much tax to give, and infrastructure is especially hard and expensive to develop in this mountainous, rainy region with dense forest. There’s also a sort of exponential effect in infrastructure development–a road makes it easier to transport materials, which in turn makes it easier to build roads. So, starting “from scratch” is especially difficult.  Of course, there obviously might be issues in accountability or management at the resource-collection level–corruption, incompetency, misunderstanding–but I want you to understand that this is not the only problem, as developing infrastructure in this area is a monumental task to begin with. I made a small video of the whole experience–apologies for the low quality, but I hope you still find it a fun glimpse into life among my family in rural Ethiopia. Uncles, aunts, cousins–they are the reason I had so much passion for this project. 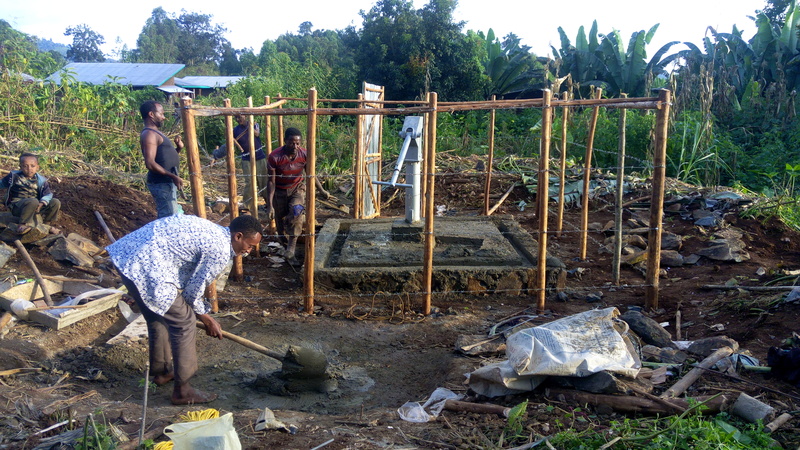 You can also see here the types of open, hole-in-the-ground wells that are common “DIY” kinds of solutions in the village, and how the final hand-dug well is much different from those! If there’s anything I’ve learned at MIT, and especially from this project, it’s that the only thing ever standing in our way is fear–fear of failure. “I’m too young” or “I’m not wealthy enough” or “I don’t have the time” or even as basic and seemingly valid as “I don’t know how to do this” (I literally knew nothing about water before starting this project), these are all excuses we tell ourselves to let that fear fester and convince us we can’t do something. But if we are courageous enough to simply try, to work hard and be dedicated, you find that those obstacles slowly, surely fall away, until you’ve achieved incredible things. Designing a Calculator with FSM Logic A web dev lesson from an MIT sophomore! MIT Moms We stand on the shoulders of giants....!! it’s ok that it’s not ok sometimes things will happen, and you have to just let yourself be.